Jacksonville, Alabama - Bear & Son Cutlery, manufacturer of premium made-in-the-USA knives, has recently added to its 4th Generation Carbon line. The new CRSB54 two-blade folding pocket knife continues the expansion of the company's premium folders with Red Stag Bone handles. 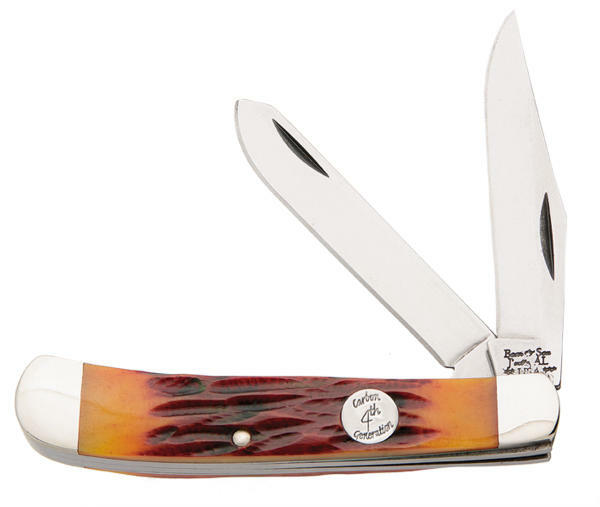 The CRSB54 4 1/8 inch 4th Generation Carbon is styled after the classic trapper folding knives. The handle is made of polished red stag bone that features warm tones and a comfortable in-hand feel. Nickel silver bolsters flank the handles to deliver an exquisite heirloom presence that ensures the knife will maintain its aesthetic appeal for years to come. In conventional trapper form, the CRSB54 blades are comprised of a clip blade and a spey blade. These are made of 1095 carbon steel for its durability in demanding applications. A hollow-ground edge profile provides optimal sharpness potential. Each blade measure 3.25 inches in length, while the closed length is an easily pocketable 4-1/8 inches. To learn more about the Bear & Son brand before the show and visit www.bearandsoncutlery.com or call 1-800-844-3034. Bear & Son Cutlery is equipped with a rich family tradition in knife making and employs a skilled and experienced work force that is capable of performing many of the extra hand operations that go into the making of their products. The Bear & Son Cutleryfactory is unique. It is full self-contained. While some companies only assemble parts brought from various suppliers and put their names on the product, Bear & Son Cutlery does everything in-house from building their own blanking dies to heat treating, grinding and assembly, and hand finishing products. These steps ensure that Bear & Son Cutlery is of excellent quality and a real value for both the dealer and consumer. Their ongoing commitment is to make them in America and make them affordable.